Well, they're not dying anymore but, the day after I wrote this to you, I noticed one of the feeders had a ragged tail and some white spots. I immediately removed her and all other feeders from the tank and treated the tank for Ich with one dose of Tank Buddies Ick Cure from Jungle Labs. It uses Victoria Green (Malachite Green) and Acriflavine. The next day I noticed one of the fancies rubbing on ornaments. Not constantly, but rubbing just the same. I let this go on for 24 hours and decided to try raising the temperature to 85 and starting a salt bath treatment of 1 teaspoon per gallon, after a 25% water change, of course. About 36 hours later I noticed more fish rubbing, so I decided to check the water parameters just in case the medicine killed the cycle. It did. Ammonia was 1 ppm. I was disgusted. So, I did close to a 150% water change to get the ammonia to 0, vacuumed the gravel in case there were Ich cysts waiting to be born, moved some large river rocks from a clean established tank into the aquarium, and started the process of recycling the tank. I test and change the water twice per day, never letting the ammonia get over .25ppm. I was unsure how to do the kind of salt bath treatment where you slowly increase the salt concentration (without changing the water for a few days), so I decided to leave the salt concentration at 1 teaspoon per gallon. The salt killed the Frogbit, so I removed it and replaced it with floating plastic plants. I make sure the new water I add is at the same temperature as the water in the tank. Over the course of the last few days, the rubbing had started to decrease in frequency as well as the number of fish actually rubbing, so I was encouraged that the salt, increased temperature, and frequent water changes was working. None of the fancies has ever had any white spots on them, nor do they now. Yesterday, I did notice two of the girls going to the bubble column coming from out of the lift tube on the filter and "drinking" the bubbles. Then I learned that the increased temperature causes less dissolved oxygen to be in the water, so I put an air stone in the tank to help out during this treatment. Today everyone's rubbing all over everything! Not darting about or throwing themselves into the plants, but rubbing gently on the ornaments, the gravel, the sponge, you name it. I had planned on keeping up with the water changes while the tank cycles, but beginning to reduce the salt concentration and temperature slowly starting next week. <Salt won't harm Guppies, so this isn't the problem. Wild/feeder Guppies can be adjusted to fully marine conditions without problems. Fancy Guppies will tolerate up to 50% seawater salinity. In fact, Guppies do brilliantly well in brackish water, arguably better than in freshwater. They're certainly less disease prone. However, salt doesn't fix every problem. Specifically, marine salt mix (as opposed to less useful tonic salt) raises the pH and carbonate hardness, making the water chemistry more stable. Now I don't know what to do. Is the salt bothering them? Is the rubbing a reaction to the ammonia that rises between water changes? I've shined a flashlight to see if it could be Velvet, but I can't tell. I don't see worms hanging from their bodies. And truthfully it's pretty difficult to tell if female fancies have white spots on them, since the only color they have is on the back half of their bodies and their tails. The males don't have any white spots, and I can't see any white spots on the females. I'm hesitant to use more medication, because I don't know what's going on! This might sound stupid, but I've become quite attached to the little fishies and want them to be happy. Oh! And that's the other thing. All of their colors are deepening really nicely, and they're eating, sleeping, and swimming normally. No one's surface, or gravel resting, or gasping that I can tell. HELP! Please. Ok, thanks. I just need a little clarification on a couple of things. With regard to the salt, I use a Malawi Salt mix recipe you gave me for my Apple Snails (which are no longer in the tank). It keeps the water chemistry "perfect for guppies" according to our last correspondence regarding the mysterious guppy deaths. So I think we're ok there. To increase the salinity I've been using regular aquarium salt. I think this is the "tonic salt" you're referring to. And I did the math wrong. It's actually 3 TABLEspoons per 5 gallons. If my calculations are correct I should be using more like 1.5 tablespoons per gallon to get to the desired .8 oz per gallon. That's a significant increase, more than double the current amount. Since the tank is recycling, I'm doing 2 water changes per day. How slowly should I increase the salt, 1.5 Tbsps. per day? Also, at one point you said you didn't think Ick was the issue. Do you think it's Velvet? I've read that the common treatment for Velvet is Acriflavine. The Ick treatment I used was a combination of Malachite Green and Acriflavine. Do you really think I need to dose the tank again? I'm hesitant for two reasons. First, it'll kill the small colony of nitrifying bacteria I've managed to rebuild since the first dose. Second, I've read that these meds can sometimes cause problems for the fish and shouldn't be used unless we're sure about what's going on. Is the latter mildly hysterical? Anyway, thanks as always for the kind and patient advice. 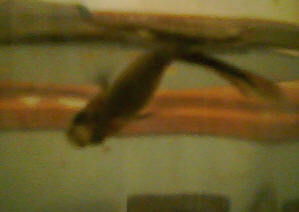 Ummm....my guppy just floats around (except at feeding time) and her gravid spot is kinds cloudy. What's wrong with her??? About two weeks ago, she gave birth to 30 even babies. Could that be the reason? Re: Mbuna Carbonate Hardness & Guppy Death. Follow-up on the latter -02/25/08 Hi Bob. I reread your responses to guppies and flashing. I also referenced all the related text on your website and haven't come to a conclusion as to what the problem is - if it is Chondrococcus like you mentioned, can I treat it (the guppies are indeed aggressive with one another but it's difficult for me to accept such a quick and abundant loss)? <Can be treated... Successfully> I see that there is medicated food for parasitic/bacterial infections. Is this helpful or just malarkey? <Is, can be helpful. Must need get the medication inside freshwater organisms (they don't "drink" much)...> I have vita-chem - would this help? <To some small degree> One of the panda Cory flashes too albeit not frequently. Water chem is fine 0 ammonia and nitrites; nitrates 5-10ppm, pH ~7.4. No visible signs of disease. I am now wondering if a 10% weekly partial water change is not sufficient. Perhaps a 25% would prove better... <I do think so... this is about the percentage I perform every Sunday on my FW systems. BobF> Thank you very much for this helpful resource. Lisa.